Earth's partner in its yearly trek around the Sun, the Moon, is geologically dead. Dried lava fields called "maria" — Latin for seas — cover its surface, along with impact craters. The maria formed about four billion years ago, when giant asteroids punched holes in the Moon's crust, allowing molten rock to bubble to the surface, where it cooled and hardened. Earth and the Moon are more like a double planet than a planet and a moon. The Moon is quite large in comparison to Earth -- about one-quarter of Earth's diameter. The two gravitationally interact with each other, most famously causing Earth's ocean tides. The interaction has other important consequences. Over time, the Moon's rotation has become tidally locked, so that the same side of the Moon always faces Earth. And the Moon acts to stabilize a "wobble" in Earth's axis. Over billions of years, this has led to a much more stable climate, which was friendly to the evolution of life. The Earth-Moon interaction also slows Earth's rotation by about two milliseconds per day per century. 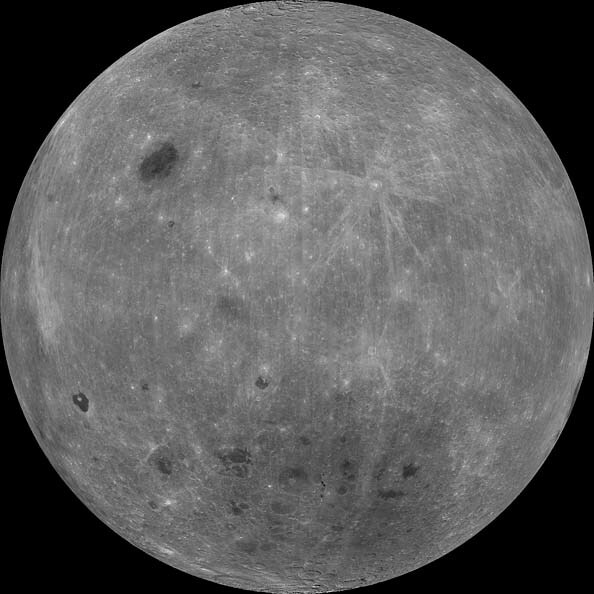 The Moon probably formed in a "big whack." The theory arose after scientists analyzed the rocks brought to Earth by Apollo astronauts and Soviet Luna probes, as well as the readings of seismometers left on the lunar surface to record "moonquakes." Their studies showed that the Moon's composition closely resembles that of Earth's crust and mantle. From this, scientists concluded that a Mars-sized body hit Earth within a few million years of its formation. The impact vaporized much of the material in Earth's crust and mantle and blasted them into space, forming a ring around the planet. This material quickly coalesced to form the Moon -- Earth's steady companion in its never-ending trek around the Sun. Just like a spinning ice skater whose rotation slows as he extends his arms, the Earth-Moon distance is lengthening because Earth is spinning slower each day. The Moon's gravitational influence is slowing Earth's rate of rotation down by one and a half thousandths of a second every 100 years. The loss of rotational energy — angular momentum, for the physicists in the crowd — is necessarily matched by an increase in the Moon's angular momentum, which results in a larger orbit for the Moon. Currently, the Moon moves less than two inches a year farther away from Earth — a tiny amount, but easily measurable with modern laser-ranging devices.